If Christianity is about eternal life then why do we make it so much about death? Recently my roommate Danny Kam showed me an evangelistic tract that he found in an In-N-Out bathroom. It had what I thought to be some pretty hilarious yet disturbing imagery. It was a story about a guy named John walking down the “highway of life.” From page one we’re reminded of his immanent death. “It’s a long trip from the cradle to the grave” and each page following tells us how much longer he has to live. 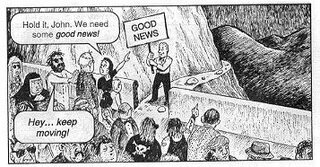 At a certain point along the “highway of life” he come across a sort of street evangelist who, with a big happy smile, tells him and his family that everyone on the highway is “doomed” (by the way… he’s holding a big sign that says “good news” on it, I found that to be really ironic). He exclaims “absolutely!” and continues telling them his “good news” that Jesus can save him and his family if they will walk down a thin creepy lookin’ road which curves around a hill so you can’t see where it goes. John’s family, in a gullible manner, takes off down the road but John does what anyone should do in a situation like this… stays behind. We’re again told how long he has to live. But when you think he’s still got 8 years he falls off a cliff (he must not have seen the gigantic crowd falling before him). He cries out to the man next to him “but you told m I’d live to be 70!” Taking off mask and revealing himself as Satan the man says “I lied!” and they continue to fall together into oblivion. Wow, I’m sure glad I accepted Jesus as my “personal Lord and savior.” Now when my miserable life ends I can hang out with the goofy guy holding the “good news” sign forever! It’s ironic how we’ve interpreted Jesus words “eternal life.” We’re so influenced by our culture and so naïve about His that we’ve made what was supposed to be all about a new kind of life now, which flows into eternity, into something much different. We’ve turned it into a sort of preparation and waiting for death to come. The good news isn’t about escaping hell. The good news is that we can really live right here, right now because Jesus makes all things new… and He does it right now!